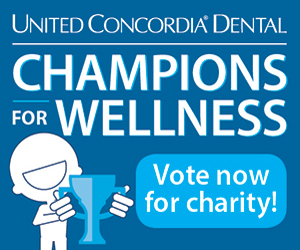 Vote for your favorite charity in the Champions for Wellness. The winning charity will get $20,000! This is a great way to help “give back” without paying a cent. According to new landmark research, regular dental care can not only help improve overall health and wellness, but it can also help reduce medical expenses. United Concordia is committed to being a champion for wellness – and now, you can help us give away a total of $25,000 to charity to help fight chronic disease. You can vote every day through November 30, 2013!